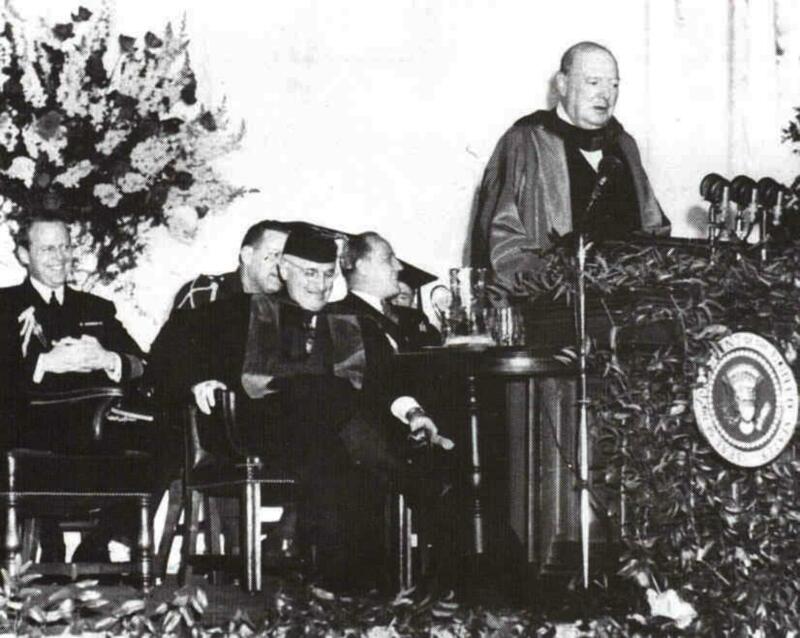 The 5th of March marks the seventieth anniversary of Winston Churchill’s speech in Fulton, Missouri, in which he declared that an ‘iron curtain’ had descended across Europe. Delivered in the presence of US President Harry Truman, who had been instrumental in securing the former Prime Minister his invitation to speak, the address is well known as a landmark in the onset of the Cold War. Yet it is rarely considered in its full historical context. For the speech – formally entitled ‘The Sinews of Peace’ – was not merely a criticism of Russia. It was the means by which Churchill publicly enunciated his vision for a new world order. Having been defeated at the 1945 general election, Churchill’s position as Leader of the Opposition gave him a unique opportunity to say things that the heads of the British and American governments could not. Afterwards, Truman publicly distanced himself from the speech, even though film of the occasion showed him enthusiastically applauding as he listened. Clement Attlee’s Labour government (which privately approved of Churchill’s remarks) said it would not comment on a speech made abroad by a mere ‘private citizen’. It may seem obvious why the speech seemed so incendiary. Just a few months earlier, the USSR, the USA and the UK had all been wartime allies in the fight against Germany and Japan. Now, Churchill was invoking the memory of his prophesies about the Nazis in the 1930s and raising the spectre of a new war. No surprise, then, that Stalin was stung into denouncing the speech in a rare interview in Pravda. Yet, in the United States, it was not Churchill’s diagnosis that was controversial so much as his proposed remedy. Today, his suggestion of ‘a special relationship between the British Commonwealth and Empire and the United States’ may seem rather anodyne. This, though was widely (and rightly) read at the time as a veiled call for a military alliance between the United States and Britain, and it was this that so divided American opinion. Quite quickly, in the West, Churchill came to be widely seen as having been vindicated by events, and the contretemps was forgotten. But the speech’s contested reception reminds us that this was only one of a series of important episodes in the start of the Cold War, not a defining moment of transition. The address at Fulton testifies both to Churchill’s power as a wordsmith and to his capacity to cause controversy. Although he surely did intend the ‘iron curtain’ slogan to grab the world’s attention, the speech is one that deserves to be remembered for much more than its most famous phrase.